A Madelung deformity is a Blount’s disease of the wrist. Therefore, surgical treatment is functionally similar to the treatment of Blount’s disease. In patients with Madelung’s deformity, one of the small wrist bones (the lunate facet), where the radius meets the wrist, is underdeveloped (hypoplastic). This leads to subluxation (partial dislocation) of the wrist bones between the radius and ulna. Dr. Paley treats this complication by opening the wrist joint from the palm-side and performing a complicated intra-articular osteotomy (bone cutting inside the joint) to elevate the depressed part of the radius and reduce the wrist bones into a joint combined with a second osteotomy to realign the lower radius and fix it with a metal plate. 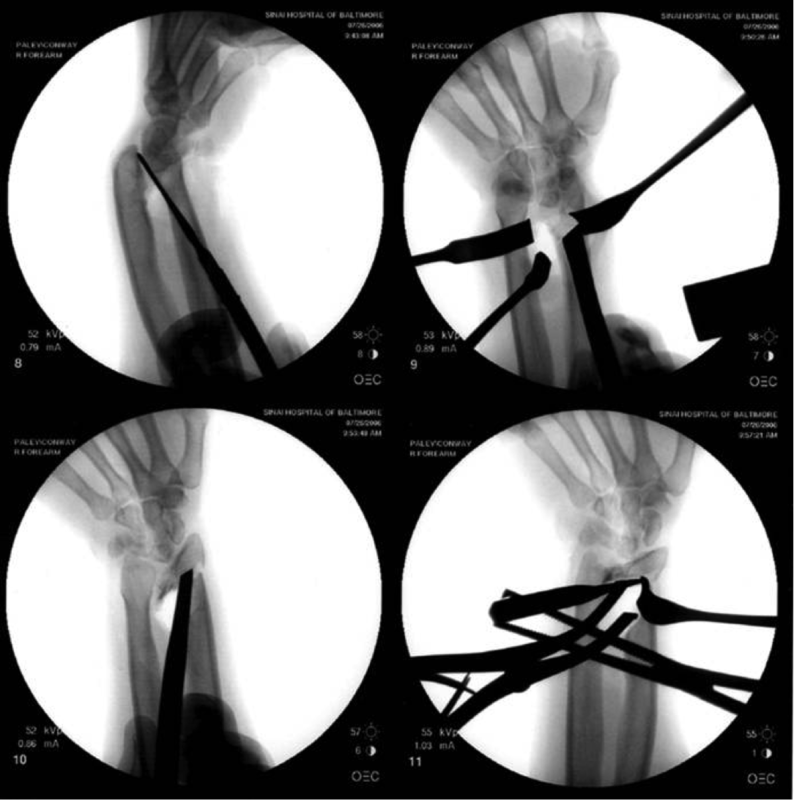 The osteotomies are combined with reduction and ligamentous reconstruction of the distal radio-ulnar joint. After reconstruction of the wrist joint, the radius may be lengthened if it is significantly shorter than the ulna. Lengthening is done after the wrist surgery has healed. An external fixator is applied to the radius and an osteotomy of the radius is performed. The external fixator slowly distracts (pulls apart) the two segments of bone and new bone forms in the gap resulting in increased length. Once the radius has reached its proper length, no further lengthening is performed. The external fixator remains until the bone has healed (consolidated), at which point the fixator is removed in a minor outpatient procedure. Dr. Paley has extensive experience in treating Madelung’s deformity, as well as almost 30 years of experience in limb lengthening and deformity correction. He has performed countless surgeries to reconstruct the wrist and lengthen the upper extremities.